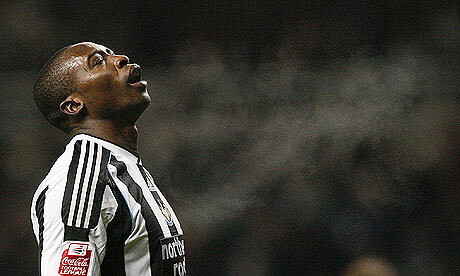 Could Shola Ameobi be in line for the coveted #9 shirt? Words by Kevin Doocey on April 9, 2010 . Born in Nigeria but an English international at a young age, Shola Ameobi has been at Newcastle United for quite some time now. He was there for Shearer’s later glory days at the start of the new millennium and now he himself, has been playing pretty well in a Newcastle shirt of late. A lot of people regard Ameobi as a clumsy, lanky striker and some people have attributed the nick name ‘Stumbling Bambi’ to the Toon striker as well. This a little harsh really considering Ameobi has pretty much scored any time he’s played for Newcastle United this season. Let’s not forget his two goals at home to Sunderland under Graeme Souness when Newcastle went on to win in an enthralling game either, 3-2, thanks to Ameobi’s two goals and indeed an excellent free-kick from Emre. Mind you, he also scored in our less fortunate result away to Sunderland last season so you can’t fault the big mans’ effort. Shola missed a lot of games for Newcastle this season due to injury but on both returns, he scored. He first game back against Coventry he scored in an important two nil away win to Chris Coleman’s side and indeed in a more crucial tie at home to Forest, he produced the goods and swept home a lovely left footed strike with less than 20 minutes remaining, later followed by an assist which saw Jose Enrique belt one home. The number 9 shirt is still left vacant since Obafemi Martins’ departure from the club and rumours are suggesting that Ameobi is closest to it, especially after Andy Carroll’s recent melee with Steven Taylor. The question whether he will score goals in the Premier League still remains but I’m confident he’ll grab a few, just like he did last season, in what was a terrible campaign. Ameobi could be in line for the #9 shirt, what do ye lot reckon? Ameobi, get real he has found his level fizzy pop league NUFC must get rid!! not good enough!! waste of good money in the premiership!! Nooooooo,Lovenkrands is better place to win it,but i feel that the one who is going to wear it is not yet in the team.. It's quite possible he'll get it but I doubt it too. Between Andy Carroll and possibly a new striker yet to arrive? I think the 9 shirt has a strange pressure that comes with it, it would be wrong to go into the Premiership and give it to one of our current strikers. Nothing against them, I just think Carroll is too young to carry that burden and Shola isn't consistent enough in the Premiership. He's a fan favourite for sure, but we need someone that can take it on and be inspired by it rather than for it to be a burden on them. Probably the best center forward at the club right now. Actually I recall a time that whoever played @ CF got the nine shirt, it`s only puts pressure on forwards, like who would want to be compared to Shearer ? If that aint pressure ,what is ? Ha Gary.. love it. "shola has found his level in the CCC league"... sigh .. you prat. He can't win Shola. He has added moment of genuine prem class to niggling CCC standard games every time he's played and notched up 10 in 10 starts. If EVER there was a player that looked too good for this league it was shola this season. Yes, loven and carroll are in form - but are also unilateral players, specialising in one area,, playing off defender's shoulders and target man respectively. Shola remains our best all-round forward,, so is the closest we have to a no.9. I suspect Hughton will bring in an experienced finisher - along the lines of Bent, Rodallega or Pavlichenko. Anyways Doocey - good article, good to see someone thinking for themself and not just ganning with 'shola's a donkey' yada, yada. From where I was sitting last monday, Shola added a touch of class for the 8 mins he was on. He still looks like he's improving as a finisher at 28 and I'd hate to loose him now. Possibly looks our most technically gifted forward. He could score 15 next season and prats like Gary would still say he should go- some people were born daft and never change I suppose. Boater (9.52pm) brings sense to a blinkered debate. Why oh why do Magpies fans insist on having players whose primary gift is to run like headless chickens? I think Shola's a worthy No.9 who, if anything, has been weakened by the insistence on trying to mold him into a new 'Mary Poppins'. If Ameobi had been given trust and games after his Barcelona performance, he'd have been top class. Still, his goals to games ratio justifies (imho) selection and the shirt to go with it. The idiots that say shola should be sold should pull there heads out there arses.Think shola would have had between 30 or 40 goals this season if he had stayed injure free.boater you are right there,some people were born daft and never change I suppose,like it you tell em mate. I still cannot believe i have read some articles that actually praise this guy. Time and time again Ameobi fails to deliver. Sure, like anyone if he is given enough opportunities he will grab a goal but for me he is far too inconsistent. For someone who has shown touches of brilliance this makes it all the more frustrating and i'm sorry but 41 goals in over 200 appearances is not a good goal to game ratio! It's laughable to even think it is. Plus he's always injured but thats another matter. Red Mag,Shola's goal scoring record, when put in the context that almost 40% of his appearances have come off the bench [204app/76sub], does not look that bad.Granted his injuries are a concern but if [again granted big if]he stays fit and gets a good run he'll do a job.As Heavenfire says some people seem to prefer headless chickens, running around with no end product.Time to stop getting on the lads back. Those on here thinking he isn't good enough should remember he will and the other strikers will only get goals if they are supplied right we have had no creativity in the mid for a while so why would expect anyone to get 30-40 goals we also haven't been playing like a team for a while but now i feel we are maybe we still need that killer pass but with this lad will score 20-25 goals a season he defo has the ability to be a better than average player not torres or rooney but defo a decent finisher none the less hope we do get that missing link in the mid then we should be ok with backup for other positions rb/lb/mr/ml. I think Shola is not a number 9. He is very much a confidence and fitness player. When given a run of injury free games he has always scored goals. Not a world beater and far too injury prone but still has a knack of scoring goals and is worth keeping as a squad player. I'd rather flog Best first! No matter what you think of the lad, he's black and white through and through, he'd quite happily sit on the benchfor newcastle and he is playing well and scoring goals at the minute. What more can we ask of him? Lets give the lad a break.